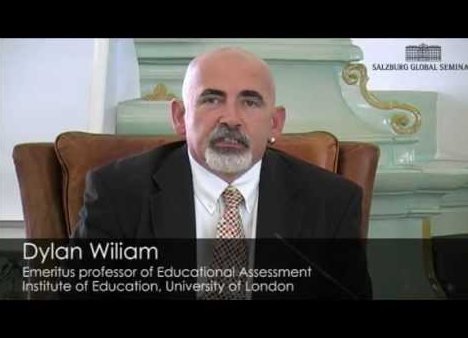 Dylan Wiliam is a world-renowned educational leader and researcher, specializing in teacher development and formative assessment. On today’s podcast, Dylan shares the key aspects of formative assessment. He offers his thoughts on teacher development. And he shares some practical ideas to consider for your teaching. In addition to hearing Dylan speak about formative assessment and learning, there are some useful links included below. On Feb 1, 2017, Dylan will be speaking at Oakland Schools. The workshop will focus on embedding formative assessment into daily practice. You can learn more about this workshop, and you can register for the event, by visiting this page. In my first post on the power of podcasts, I talked about their place in the ELA classroom. Not only do they meet important standards, but they develop crucial listening skills. And I talked at some length about Serial, a must listen to podcast. So if you’re sold on bringing this medium into your classroom, what podcast do you choose and how do you effectively integrate it effectively from a curricular and skill standpoint? Below are some ideas for how to think about choosing a podcast to work with what you’re already teaching. This episode pairs well with texts about risk-taking, the consequences of risk-taking, a desire to leave reality, and escape. I can imagine having students listen to it in conjunction with Into the Wild, “The Secret Life of Walter Mitty,” Tennessee Williams’ The Glass Menagerie and even Romeo & Juliet. Or perhaps you’re doing a character study on the morality of characters in a text like Hamlet, Atonement by Ian McEwan, or To Kill a Mockingbird. Students could list to segments of TAL‘s episode called “Good Guys” and compare these real life stories to the choices made by characters in the fiction text they’re reading. Lots of men think of themselves as “good guys.” But what does it actually take to be one? To be a truly good guy. Stories of valiant men attempting to do good in challenging circumstances: in war zones, department stores, public buses, and at the bottom of a cave 900 feet underground. Reading Anchor Standard 9: Analyze how two or more texts address similar themes or topics in order to build knowledge or to compare the approaches the authors take. When you use podcasts in this way in your classroom, students identify and analyze the implicit and explicit arguments being made in each “act” of a TAL podcast or other podcast, comparing the arguments within an episode. They can then respond with their own written or recorded narrative argument about the topic. This American Life episodes provide listeners with a series of narrative arguments around a single theme. What do I mean by narrative argument? Each act delivers a compelling story, and that story and the producer’s reflection on the events in the story, create an argument. The creation of an implicit argument via narrative and reflection is incredibly difficult to do, as students discover when they try to write a personal essay. But that difficulty is all the more reason to listen to TAL episodes and to even have your students create mini-podcasts, which I’ll talk about in my next post. So you’ve decided what podcast to use and how it works with your curriculum. But how do you scaffold and support good listening skills? First Listen – Listen to the podcast all the way through to make sense of the story and get the gist. Pause occasionally to have students jot down names of people, questions that come up and big ideas that are explicitly or implicitly stated. Second Listen – With your students, develop a listening agenda. What questions do you/they want answered? What’s the main idea of the episode? What aspects of the episodes structure contribute to their understanding? Chunk the listening by stopping every 5-10 minutes to allow students to jot notes and add to their graphic organizers (see the next section). Third Listen – This very focused listen allows the class, small groups, or individuals to return to specific points in the podcast to re-listen for deeper analysis in order to confirm or test initial theories they developed based on their early listening. Timeline of Key Moments/Events – A chronological list of key moments in the story that will help them later develop ideas about the episode’s structure. Structure Picture – Students draw a picture of how they perceive the structure of an episode. This might follow the more traditional text structure graphics we’re accustomed to or might be more of a mind mind. People Map – As they listen, have students develop a map of characters and how they’re related — like this one on the Serial website. Question Web – What questions remain unanswered? Students create a web of both factual and analytical questions, connecting those that relate to and generate other questions. Have ideas to share about good podcasts for student listening and how to use them in the classroom? Please share in the comment section. In my final blog post on podcasting, I’ll provide some ways of thinking about having students produce their own podcasts, and possible pitfalls in the process. Delia DeCourcy joined Oakland Schools in 2013 after a stint as an independent education consultant in North Carolina where her focus was on ed tech integration and literacy instruction. During that time, she was also a lead writer for the Common Core-aligned ELA writing units. Prior to that, she was a writing instructor at the University of Michigan where she taught first-year, new media, and creative writing and was awarded the Moscow Prize for Excellence in Teaching Composition. In her role as secondary literacy consultant, Delia brings all her writing, curriculum design, administration, and teaching skills to bear, supporting districts in their implementation of the Common Core via onsite workshops and consultations, as well as workshops at Oakland Schools. She is currently spearheading the development of literacy-focused online professional learning modules as well as the building of a virtual portal where Michigan educators can learn and collaborate. During the twelve hour drive from Michigan to North Carolina and back over the holidays, I listened to a lot of podcasts. I admit it: I’m a podcast addict. Any time I have to drive for an hour or longer, I listen to a podcast–This American Life, The Moth, Ted Talks Radio Hour, Radio Lab, Snap Judgment… All that listening and driving got me thinking about using podcasts in the classroom and why it’s a relevant medium. Speaking & Listening Standard 2: Integrate and evaluate information presented in diverse media and formats, including visually, quantitatively, and orally. Speaking & Listening Standard 3: Evaluate a speaker’s point of view, reasoning, and use of evidence and rhetoric. Why Is Podcasting an Important Medium? I remember talking to a colleague a few years ago who proclaimed that podcasting was not new media. She said it was just recorded radio and that podcasting was over. But podcasting is so not over and it’s a lot more than recorded radio. Sometimes podcasts never appear first on the radio at all. So why is this an important and popular media form? Podcasts are available on demand via our mobile devices, thanks to iTunes and the websites of popular podcasts. So we can listen anytime, anywhere. There is a growing library of free, high-quality podcasts on a wide range of subjects. They run the gamut of nonfiction genres: storytelling, informational, and argument-focused podcasts ranging in purposes from entertainment to news to self-help (exercise, nutrition, spirituality, emotional health). We can multi-task while we listen–drive, make dinner, walk the dog, exercise at the gym. As with other digital texts, the general public (students!) can create and publish podcasts–and they are in fairly high numbers. It’s Baltimore, 1999. Hae Min Lee, a popular high-school senior, disappears after school one day. Six weeks later detectives arrest her classmate and ex-boyfriend, Adnan Syed, for her murder. He says he’s innocent – though he can’t exactly remember what he was doing on that January afternoon. Adnan, a popular student with strong ties to the Muslim community, is later found guilty and sentenced to life in prison. He was 18. And as the very first episode of Serial unravels for its listeners, the evidence was contradictory and, in some instances, spotty. It’s great storytelling and relevant to your students. The cast of characters is almost entirely high school students (or they were at the time of the murder) living through the things your students experience–juggling school and extracurriculars, navigating cultural differences between home life and school life, experiencing young love, making their way through the simmering stew of high school social life. This will seriously engage your students. Serial has changed the face of podcasting. It’s like the True Detective of radio (with a lot less violence). People could not wait for each new episode of Serial to be released on Thursdays and there was no telling which direction the story would turn and if the producers would decide to declare Adnan innocent or guilty. It has been downloaded more than any other podcast–more than 5 million times. And unlike many mainstream podcasts, it was not orignially broadcast on the radio. To read more about Serial’s popularity and possible reasons for it, check out this Salon article. It has caused a stir on the internet. People are blogging about it, arguing about it, and commenting non-stop. There have been many articles published as the story has unfolded week to week. The number of Serial-related threads on Reddit alone are a clear indicator of how this podcast has captured people’s imaginations. And there’s a new two-part interview with the star witness whose testimony led to Adnan’s conviction and life sentence. The Serial website contains all kinds of really cool visual artifacts related to each episode. Using these in conjunction with the episodes means students can analyze across media–a Common Core dream! Serial provides endless ways to study central idea/claim, argument and evidence, theme, bias, character development and text structure. If you don’t want to commit to all twelve episodes of Serial, consider using only the first episode. That 60 minute audio text alone will make for some very interesting and creative teaching and learning. In my next post, I’ll talk about developing close listening and annotation skills and other ways of using podcasts in the classroom. I’ll also suggest specific episodes from other podcasts you might use. Do you have any podcasts you love? Please share in the comments section. And if you’re already using podcasts in your classroom, please share your ideas!